Symphony of the Mountains began in 1946 as Kingsport Symphony Orchestra with just twenty-seven musicians attending the first rehearsal. That number quickly grew to more than forty with their first concert free to the public. Neither the musicians nor the conductor were paid. In 2003, the Kingsport Symphony Orchestra was renamed Symphony of the Mountains to represent both their change to a fully-professional orchestra and the new breadth of their service area throughout Northeast Tennessee, Southwest Virginia, and Western North Carolina. Today, Symphony of the Mountains consists of more than 90 professional musicians led by Conductor Cornelia Laemmli Orth. Musicians call a great many places home including the Tri-Cities, TN/VA; Knoxville, TN; Asheville, NC; Winston Salem, NC; and beyond. This reflects the footprint of performances throughout the Mountain Empire region as they bring with them the guiding principles to Entertain, Educate, and Enrich through concerts and educational programs that reach into the most rural of areas to bring the beauty of orchestral music to life for everyone. Cornelia Laemmli Orth is in her thirteenth season as Music Director of Symphony of the Mountains and in her third season as Music Director of the Cayuga Chamber Orchestra in Ithaca, NY. 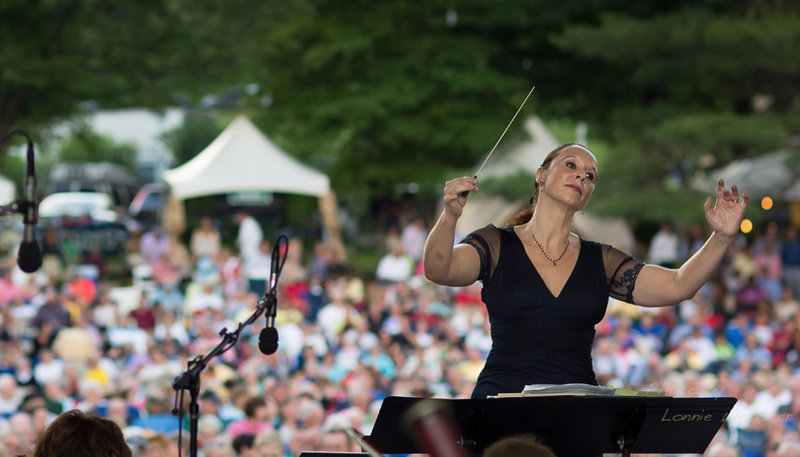 In addition to Masterworks Series, she has developed new series of Summer Outdoor, Family, Young People, Pops, Patriotic and Cross-Over concerts. World renowned soloists are regular guests with Symphony of the Mountains. As an advocate for Contemporary Music, Cornelia brings a variety of new music to the region. Her concert lectures, involvement with area schools, colleges and universities, speeches for civic organizations, regular TV and radio appearances and collaborations with regional art organizations have made her a vital part of the community. In February 2019, Cornelia will have her debut with Opera Ithaca in Ithaca, NY. In October 2017, she appeared as guest conductor with the Brevard Philharmonic in Brevard, NC. From 2010-2012, she held the position of interim music director for the Appalachian Philharmonic and the Appalachian State University Opera Program in Boone, NC. She resumed these responsibilities for the 2015-2016 season, and serves now on the advisory board for the Hayes School of Music. During the 2014-2015 Season, Cornelia had her debut as guest conductor with the Asheville Lyric Opera in Asheville, NC. Prior to her engagement with Symphony of the Mountains, Cornelia held the position of music director and conductor of the Oak Ridge Symphony and Choir. She served as Associate Conductor and later Principal Guest Conductor of the Knoxville Symphony from 2002-2008 and since then has had several appearances with this orchestra. In Europe, she was music director of the Operetta Theatre in Moeriken, Switzerland, guest assistant conductor under Philippe Jordan at La Scala in Milano, Italy, worked with the Bohuslav Orchestra in the Czech Republic, and conducted many concerts with choirs and ad hoc orchestras with musicians from the Zurich Opera House and the Tonhalle Orchestra. Cornelia received her Lehrdiplom in piano from the Conservatory at Winterhur and graduated from the Conservatory and University in Zurich with her Masters in Music Education and Choral Conducting. She obtained her Masters in Orchestra Conducting from Northwestern University, where she studied under Victor Yampolsky. In a variety of workshop settings, she studied under Larry Rachleff, Marin Alsop, Joann Falletta, Robert Spano, Kirk Trevor, Tsung Yeh, Milen Nachev and Johannes Schlaefli. Cornelia convincingly combines the classical-romantic tradition of her old world origins with the unique American flavor that her international background and extensive working experience in her adopted country has provided her and is a sought-after guest conductor in the USA and in Europe.